DAAR Communications wey be owners of TV station AIT and radio station Raypower, say politics get hand for why goment scata di company gate house and fence on Tuesday. 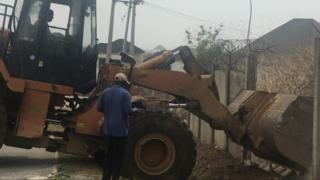 Some officials of development control from Abuja Metropolitan Management Council, bin land di Abuja Headquarters of di station wit buldozer, break-break dia gate house and remove portion of dia fence. Tony Akiotu wey be oga patapata of DAAR Communications explain say na because goment see dem as opposition station na im make dem do di demolition. But di oga for Abuja Metropolitan Management Council, Umar Shuaibu say politics no get hand for di mata and say DAAR Communications encroach pipo land to build di gate. "We bin agree wit Chief Raymond Dokpesi (owner of DAAR communications) to shift im gate inside to solve dis wahala, but since den e refuse and na im make we demolish," e tok. One of di main issue wey cause dis gbege na sake of di real size of DAAR Communications land. Even during di time of former presido Olusegun Obasanjo, di station bin run into wahala too as FCDA pipo dem bin accuse dem say dia building scata Abuja master plan. "Dem demolition our studio den and as part of compensation, di goment come give us di land wey now dey cause gbege," Akiotu explain. But FCDA pipo insist say di land belong to ordinary pipo and dem don write and hold meeting with DAAR Communication and beg dem to cari dia surveyors come make dem measure di land and know dia own area, but dem refuse. "Our only goal na to make sure say oda Nigerians get access to dia land," Shuaibu explain. Di two party don dey ontop dis wahala for long before e dey end on top demolition. "Nigeria army no get right to attack media especially now wey election near"